Anna, why so quiet lately? Well, first there was Son #4 Bar Mitzvah and now I am turning my attention to my neglected garden which is teaming with wild garlic. My back garden resembles the picture above. Just add in over 100 wild garlic and you get the picture. And yes, I am crazy enough to pulled them. Bulb and all. Why not? It is mine for the taking. Better eating through foraging. I bet you have these chive like onions throughout your property too. While I was pulling the bulbs, the plants smelled like onion and reminded me of chives. Originally I thought they were wild onion due to their smells. However, I learned that I had wild garlic not wild onions. The two look very different. 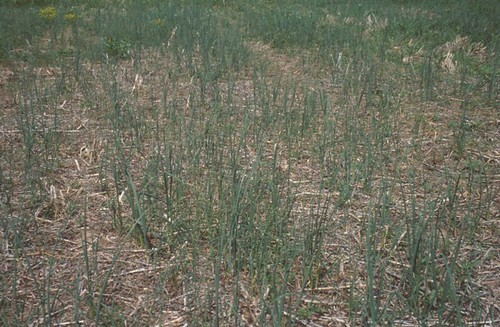 According to Department of Crop and Soil Sciences at Michigan State University, wild onion has a flat leaf and wild garlic has a tubular hollow leaf. Wild garlic also has a thin paper like cover around the bulb; whereas, wild onions have fibrous-matting around the bulb. As you can see from the above video, my “weed” is definitely wild garlic. And smells great. Similar to a shallot. Many of you might of heard of Ramsons. which is also a wild garlic (Allium ursinum) It leaves wilt like spinach. I have the specie, Allium vineale L., which leaves resemble a scallion. Forging can be fun but you need to know what you are looking for. The cousin of wild garlic is Star of Bethlehem, which the parts of this plant are poisonous. It doesn’t have the onion/garlic smell and has a light green midrib. If eaten, you can exhibit ” stomach and intestinal irritation, which is followed by abnormalities in the heart’s rate and rhythm, and this can progress to fatal cardiac arrythmias.” Not good. How Do you Prepare Wild Garlic? When pulling, I was really careful to pull the entire plant out. If I left any of the bulb in the ground, the plant would return next year. I don’t mind a few wild garlics but a 100 is just too much for me. Just wash the dirt off the plant and peel the paper covering. Watch the video above so you can see how I pulled off the paper covering. I won’t fool you. Cleaning up over a 100 wild garlic took me 2 hours. I thought I would never finished. I noticed that a small piece would break off as I cleaned similar to a garlic clove. I just kept it to use. Most of the recipes were for ramps, not my variety of wild garlic. However, if you are dying for a recipe, here’s wild garlic, eggs and bacon. I sure you can serve vegetarian bacon in lieu of the real thing as well as tofu scrambled eggs in lieu of eggs for those wishing a vegan meal. Have your foraged from your backyard? If so, what did you eat? Have you eaten wild garlic similar to mine? How have you used them in recipes? How have you stored your wild garlic? Can you freeze it? You encouraged me to did a web search about the history of Garlic & onion. I found that Garlic was mentioned at both the Bible & Muslim holy book Quran. at versa no 61 from Surah 2. Al-Baqara (The Cow). *pl refer to the link below. Wild Garlic is used as part of regiment for getting rid of worms from sheep and goats. My husband wanted to destroy all that grow on our property along with wild edibles he considers weeds but now he’s learning just how dependable wild edibles are not only to us but for our herd. put those wild garlics into anything for which you want a very strong flavor. In sum if you might have used conventional garlic, you can probably use the wild variety. The Scandinavians use a lot of it. I believe it’s native to that part of the world. The wild garlic is really strong. I do sub it for garlic and have kept the tops too to sub for green onions.